My friend Ray is a scavenger with a great eye, though some may despair that his life-long ‘recycling’ efforts attract such accolades. 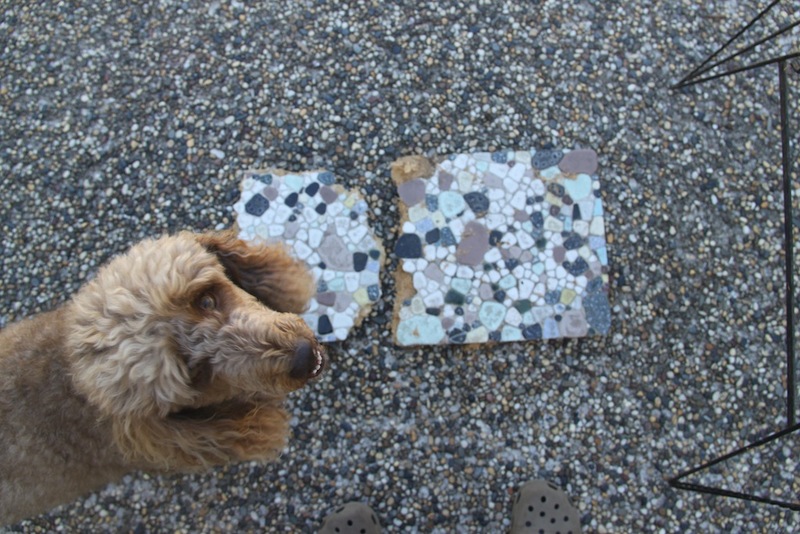 He emailed me to say he’d picked up some tiles that I might like for mosaics. They came from the broken top of a coffee table put out for the hard garbage collection. What treasure! Tiles of various sizes and shapes fitted together like a jig saw in muddy fifties colours. When I went to pick up the tiles, there amongst the rescued ‘treasures’ (junk to some), was the rusty old table frame that once held the tiles. Can I have that too, I asked? I have plans for the table, but as yet, the perfect project for the tiles eludes me. In the meantime, they are tucked away in my bower of mosaic gems.